It may be 68 years since they made their last film, but Laurel & Hardy are box-office attractions again. 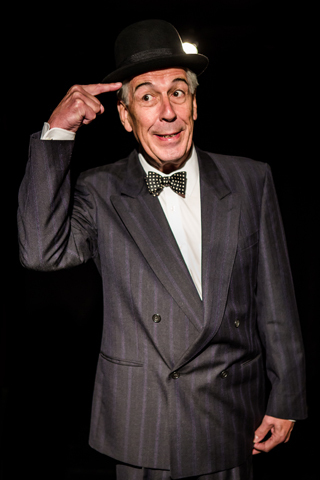 The recent movie Stan & Ollie, about their 1953 tour of Britain, has picked up critical acclaim and a Bafta nomination for Steve Coogan, and now Jeffrey Holland has brought his one-man play, …And This Is My Friend Mr Laurel, to Junction in Goole. Set a couple of years after that tour, it finds Stan (Holland, who co-wrote the script with Gail Louw) visiting the bedside of an ailing Ollie, who has suffered a stroke. In theory, he’s there to cheer up his long-term comedy partner, but as he talks, Stan can’t help but look back over his own life, which includes a tragedy, as well as a string of failed relationships (there’s a reason the press dubbed him ‘the much-married Mr Laurel’). And while they may have been huge stars in their heyday, their later years brought plenty of professional frustrations, especially for Stan, who was the more driven and ambitious of the pair. That may sound heavy going but as you would expect of a play about Laurel & Hardy, especially one starring the actor who played Spike in Hi-de-Hi!, there are plenty of lighter moments too. Although Holland doesn’t shy away from showing Stan’s flashes of despair and anger, his affection for his partner shines through. For most of the play, Ollie is represented by a bed frame, but there are also scenes where Holland recreates their gags, playing both halves of the double act with great impressions and perfect timing. Holland later says he can tell how well a performance has gone by how many of the audience stick around after the one-hour play for the Q&A section, in which case he can definitely mark Goole down as a roaring success. Not only did everyone come back after the interval, but the audience would have happily kept him chatting about Laurel’s life long after the show’s 10pm end. There were some people there who were familiar with Laurel & Hardy’s most famous films but knew relatively little about their lives off-screen (like me), some who had read quite a bit about them (like my dad, who also thoroughly enjoyed the performance), and quite a few super fans (like the man who prefaced his question by revealing he went to the Laurel & Hardy Museum in Ulverston for his honeymoon), and we all learned something. For those fans who didn’t make it, the movie Stan & Ollie, which gets Holland’s seal of approval, is also coming to Junction in February, but you really missed a treat by not seeing …And This Is My Friend Mr Laurel.